I've always been a bit dismissive of cards with a relic or game-used uniform pieces inserted within them. Sure, they look cool sometimes, but how do you know if the uniform piece is real? Fakes are unfortunately everywhere, and recent news detailing the FBI's continued prosecution of the scammers only emboldens my view that this stuff isn't worth the premium they sell for. Then, Baseball started their MLB Authentication program, and suddenly fans/collectors had a means of receiving and verifying the legitimacy of various memorabilia items. 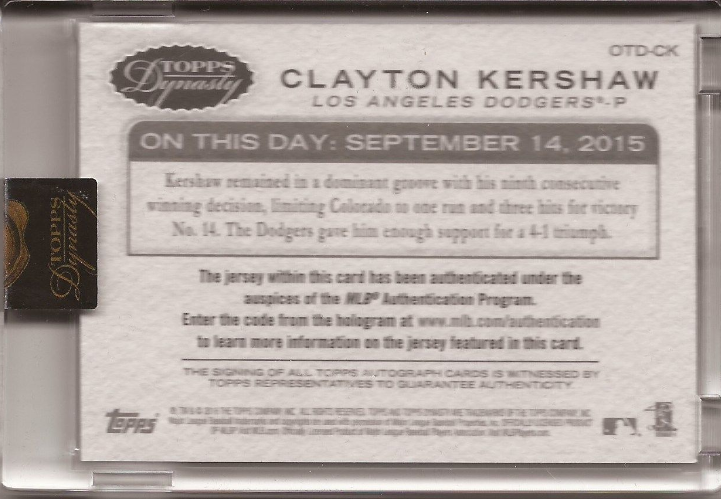 Soon thereafter, Topps joined the train and started to include MLB Authentication stickers on several of their higher-end cards. Suddenly, doubt no longer is an issue, and I find myself singing a different tune. Kershaw remained in a dominant groove with his ninth consecutive winning decision, limiting Colorado to one run and three hits for victory no. 14. The Dodgers gave him enough support for a 4-1 triumph. For now, cards with MLB Authentication stickers appear to only be available in high-end offerings. Hopefully, they'll extend the practice to all of their brands. Unfortunately, it's incredibly difficult to verify vintage uniforms, so game-used cards claiming to have a relic piece from a Sandy Koufax or Babe Ruth uniform will remain suspect, in my mind. BTW, I'm still in the process of collecting photos of all the other Dodger cards that can be found in packs of Topps 2016 Dynasty Baseball. So stay tuned. I hope to have a post up on those cards in a few days. 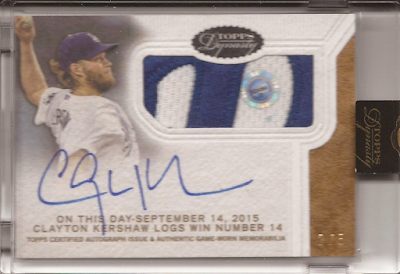 In the meantime, check out the below video that highlights Clayton Kershaw's day on the mound in mid-September 2015.